FM25 Fixed Wall Mount | ICWUSA.com Inc. The FM25 mounts a monitor 2.25″ (5.7 cm) from the wall using a lockable keyhole system. 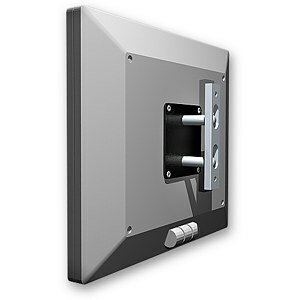 The wall plate locks onto the wall without tools and has a security set screw. Used extensively by exhibitors, the wall plate stays attached to the exhibit; the monitor is then shipped with the mounting plate attached. This wall mount is an excellent choice for kiosks and trade show exhibits where monitors need to be quickly installed. This model is designed for monitors with a 75mm by 75mm VESA interface. Machined out of aircraft-quality aluminum, this unit is powder coated black for a durable, lasting finish. Hand assembly ensures that a quality product is shipped to you.